In Hebrew he is known as Avram, and later Avraham. In English, he’s Abram, and later Abraham. You’ve got to sympathize with Avram here. He’s got a point. But what kind of laugh is this that he is laughing? 10 He said, “I will certainly return to you around this time next year, and Sarah your wife will have a son.”Sarah heard him from the entrance of the tent, behind him. 11 Avraham and Sarah were old, advanced in years; Sarah was past the age of childbearing. Sarah’s laugh is a different kind of laugh. Hers is the laughter of incredulity. She is in effect saying. “You’ve gpt to be kidding!” This is why she denies having laughed–because it was not the laugh of faith. But Avraham’s laugh is not like hers. His is the laugh of faith-filled delight and amazement in the face of what appears to be impossible. 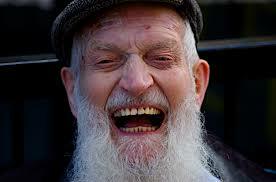 This is Avraham’s laugh. And I can relate. At this time in our lives, my wife and I are not quite as old as Avraham and Sarah. But we have a baby of our own on the way: the baby is our plan to move to New York City. Every time I talk about this I laugh. Why? Because it is so ridiculous! It is so impossible! We are quite broke and New York is the most expensive city in America! But like Avraham, we believe that God has spoken, and we laugh the laugh of delighted amazement! We don’t know how God is going to pull this off, but something’s happening! And we can only laugh with incredulous delight. The difference is that Avraham’s laugh is the laugh of faith, but Sarah’s of unbelief. What laugh are you laughing? Holy hilarity is real and I laugh with you to enjoy the ride!